The ProLiant DL370 G6 is the most versatile rackmount model in HP's sixth generation offering flexible expansion and scalable storage to meet the growing demands of your business or remote office. As the rackmount equivalent of the expandable tower ML370 G6, the DL370 G6 delivers leading performance and energy efficiency in a dual socket 4U rack optimized chassis. Powered by the Intel Xeon 5500 and 5600 series processor family, the DL370 G6 supports up to two six-core CPUs with a maximum of 12MB cache per CPU. Eighteen dual in-line memory module (DIMM) slots for DDR3 memory allow for a maximum of 384GB total RAM operating at up to 1333MHz memory speed. Aventis Systems carries the DL370 G6 in both 2.5" and 3.5" hard drive chassis options. The 2.5" HDD model includes eight hard drive bays standard, with the optional drive cage and SAS controller expander upgrade to allow for a total of sixteen hard drives. The 3.5" HDD model supports a total of six drives standard, with the optional drive cage and SAS controller expander upgrade for a total of twelve hard drives total. Nine available I/O slots that support PCI-Express Gen2 allow for network expansion to meet the needs of your growing business. All DL370 G6 models from Aventis Systems ship standard with the Smart Array P410i RAID controller with 256MB cache, dual redundant power supplies, and iLO 2 for remote management. The optional iLO Advanced upgrade is available to offer even more remote functionality to save in travel costs and reduce time to repair. Please browse our DL370 G6 models below and click through to build your custom configuration. Do you need similar specifications and expandability in a tower form factor? Please check out our ML370 G6's. Do you have a question? We're here to assist you! Please call us at 1.855.AVENTIS (283.6847) or use our Live Chat Live Chat during regular business hours. You can also email us at Sales@AventisSystems.com for a custom quote. 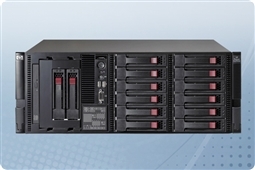 Aventis Systems carries Aventis Certified Reconditioned HP ProLiant DL370 G6 servers. All servers from Aventis System include a 3 year Comprehensive Warranty, with eligibility for optional Express warranties and onsite services.